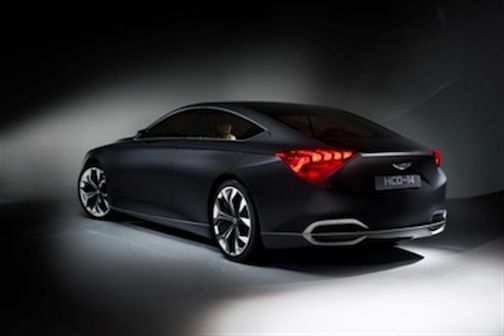 If you want to see the future of premium luxury cars, look no further than the Hyundai HCD-14 Genesis Concept car. It's much more than just another concept car the South Korean automaker brought to Detroit earlier this year. It is one of the most significant cars of this decade, and has been recognized as the 2013 “Concept Car of the Year” at the twelfth annual North American Concept Vehicle of the Year Awards. The HCD-14 beat out competitors in the “Concept Car” category including the Honda EV-STER and Toyota Corolla Furia. What makes this car so significant? The HCD-14 Genesis has more than just a great exterior design, but it reveals the technological future of Hyundai’s premium line-up with new technology that will be coming to the premium brands. It features driver eye-tracking and hand-gesture recognition, thumb controls or gesture recognition used to select navigation, infotainment, audio, HVAC, and smartphone connectivity functions. These will all be technological advancements we will see in future luxury cars from Hyundai and other automakers. We can look for Hyundai to continue to move into developing more premium luxury vehicles in the future. They will need to do this so they can compete in the premium luxury segment and be considered a global player. The South Korean automaker had global aspirations and a business philosophy that comes down to three words, “defy, design, delight.” Look for Hyundai to break conventional wisdom and do things different than most automakers. Look for Hyundai to continue to design cars that defy conventional wisdom and also delight and satisfy their customers needs. It’s a good business model to follow and it’s moving the South Korean automaker forward. The Hyundai HCD-14 Genesis Concept gives us a good idea of where premium luxury vehicles and the South Korean automaker is headed. Watch Hyundai HCD-14 Genesis concept video.